Hi friend! It's my last day at home before CHA and I'm trying to get rid of this sore throat. But other than that, things are going good. I can't wait to share pictures with you! 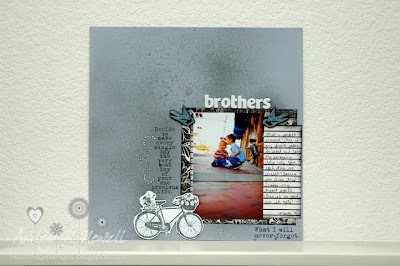 Today, I'm sharing a layout I made for the Unity Stamp Co guest designer contest. Sadly, I didn't make it into the next round but what can you do? I don't normally do layouts but I thought I'd go out of the box for this one. I have to say that this is one of my favorite layouts that I've ever made. I think it has a lot to do with the picture which is my FAVORITE ever! 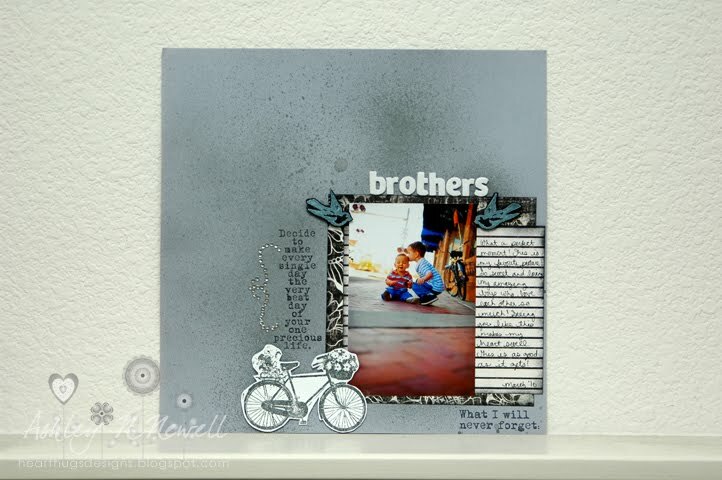 I think your layout is fabulous, such a darling picture and I love the little bike. Have fun at CHA! Wow, this knocked my socks off girl! I LOVE IT! I love your layout Ashley!! These boys are precious and that picture is priceless!! Have fun at CHA, wish I could go! This is just the cutest layout.